Modeling crowd motion is central to situations as diverse as risk prevention in mass events and visual effects rendering in the motion picture industry. The difficulty of performing quantitative measurements in model experiments has limited our ability to model pedestrian flows. 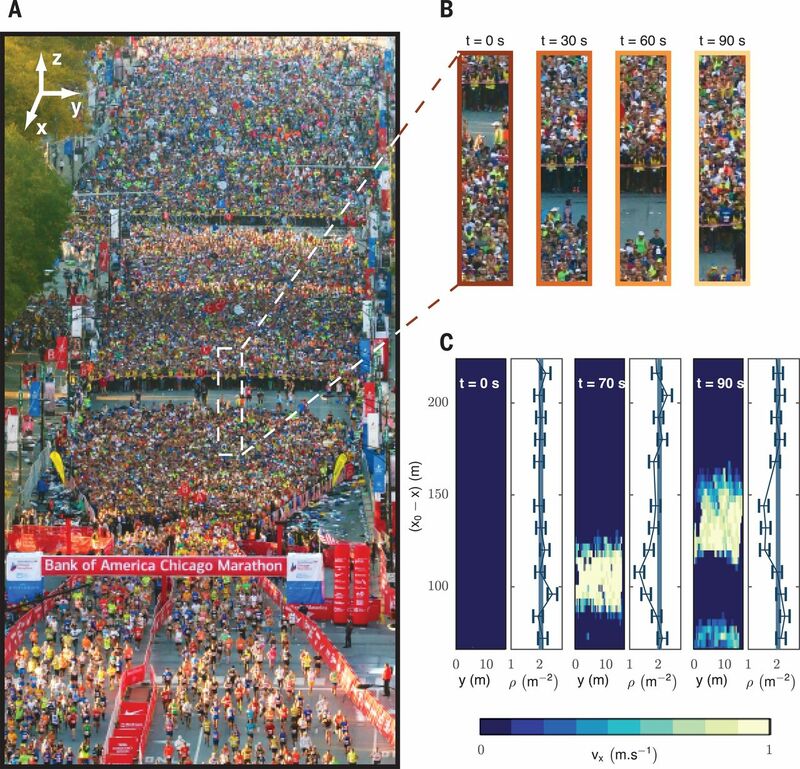 We use tens of thousands of road-race participants in starting corrals to elucidate the flowing behavior of polarized crowds by probing its response to boundary motion. We establish that speed information propagates over system-spanning scales through polarized crowds, whereas orientational fluctuations are locally suppressed. Building on these observations, we lay out a hydrodynamic theory of polarized crowds and demonstrate its predictive power. We expect this description of human groups as active continua to provide quantitative guidelines for crowd management. On Earth only a few legged species, such as water strider insects, some aquatic birds and lizards, can run on water. For most other species, including humans, this is precluded by body size and proportions, lack of appropriate appendages, and limited muscle power. However, if gravity is reduced to less than Earth’s gravity, running on water should require less muscle power. Here we use a hydrodynamic model to predict the gravity levels at which humans should be able to run on water. We test these predictions in the laboratory using a reduced gravity simulator. We adapted a model equation, previously used by Glasheen and McMahon to explain the dynamics of Basilisk lizard, to predict the body mass, stride frequency and gravity necessary for a person to run on water. Progressive body-weight unloading of a person running in place on a wading pool confirmed the theoretical predictions that a person could run on water, at lunar (or lower) gravity levels using relatively small rigid fins. Three-dimensional motion capture of reflective markers on major joint centers showed that humans, similarly to the Basilisk Lizard and to the Western Grebe, keep the head-trunk segment at a nearly constant height, despite the high stride frequency and the intensive locomotor effort. Trunk stabilization at a nearly constant height differentiates running on water from other, more usual human gaits. The results showed that a hydrodynamic model of lizards running on water can also be applied to humans, despite the enormous difference in body size and morphology. Citation: Minetti AE, Ivanenko YP, Cappellini G, Dominici N, Lacquaniti F (2012) Humans Running in Place on Water at Simulated Reduced Gravity. PLoS ONE 7(7): e37300. Among all of the sub fields in physics, fluid dynamics research consistently generates some of the most beautiful images and videos. In honor of the upcoming APS Division of Fluid Dynamics meeting in San Diego, today we bring you one such example video. Typically, when a droplet of water plunges into a pool of water, it will bounce slightly and then coalesce with the rest of the water. But there’s a way to keep the bounce going indefinitely. If you put the pool of water on top of a loud speaker, you can vibrate the surface. This vibration can cause water droplets to continuously bounce and levitate atop the liquid surface. 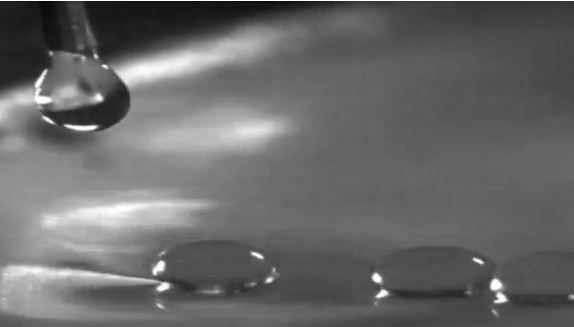 Physicists Pablo Cabrera-Garcia and Roberto Zenit from National Autonomous University of Mexico conducted the experiments and filmed them with a high-speed camera for your viewing pleasure. Check it out! You can learn more about the videos from the researchers’ arXiv article. Also, check out the Division of Fluid Dynamics website for more videos and images. This year’s galleries should be up in the next month or so. Collective vibrations in a crystal, called phonons, are a type of Nambu-Goldstone boson. UC Berkeley physicists have proved that counting the number of bosons in a material, whether a solid crystal, a magnet, or a superfluid, tells you what type of behavior the material will have at low temperatures where symmetry is spontaneously broken. Credit: Haruki Watanabe/UC Berkeley. Click ‘Enlarge’ for animation. Matter exhibits weird properties at very cold temperatures. Take superfluids, for example: discovered in 1937, they can flow without resistance forever, spookily climbing the walls of a container and dripping onto the floor. In the past 100 years, 11 Nobel Prizes have been awarded to nearly two dozen people for the discovery or theoretical explanation of such cold materials – superconductors and Bose–Einstein condensates, to name two – yet a unifying theory of these extreme behaviors has eluded theorists. University of California, Berkeley, physicist Hitoshi Murayama and graduate student Haruki Watanabe have now discovered a commonality among these materials that can be used to predict or even design new materials that will exhibit such unusual behavior. The theory, published online June 8 by the journal Physical Review Letters, applies equally to magnets, crystals, neutron stars and cosmic strings. The theorem Watanabe and Murayama proved is based on the concept of spontaneous symmetry breaking, a phenomenon that occurs at low temperatures and leads to odd behavior. This produces superconductors, which allow electric currents to flow without resistance; or Bose-Einstein condensates, which have such low energy that every atom is in the same quantum state. By describing the symmetry breaking in terms of collective behavior in the material – represented by so-called Nambu-Goldstone bosons – Murayama and Watanabe found a simple way to classify materials’ weirdness. Boson is the name given to particles with zero or integer spin, as opposed to fermions, which have half-integer spin. Earlier theories by Nobel Laureate Yoichiro Nambu predicted that magnetic spins oscillate in two directions independently, and thus magnets have two Nambu-Goldstone bosons. The new theory shows that in ferromagnets, these two waves are not independent, so that the there is only one Nambu-Goldstone boson, a precession wave as shown above. Credit: Haruki Watanabe/UC Berkeley. Anthony Leggett of the University of Illinois at Urbana Champaign, who won the 2003 Nobel Prize in Physics for his pioneering work on superfluids, pointed out that “it has long been appreciated that an important consequence of the phenomenon of spontaneously broken symmetry, whether occurring in particle physics or in the physics of condensed matter, is the existence of the long-wavelength collective excitations known as Nambu-Goldstone bosons. Symmetry has been a powerful concept in physics for nearly 100 years, allowing scientists to find unifying principles and build theories that describe how elementary particles and forces interact now and in the early universe. The simplest symmetry is rotational symmetry in three dimensions: a sphere, for example, looks the same when you rotate it arbitrarily in any direction. A cylinder, however, has a single rotational symmetry around its axis. Some interactions are symmetric with respect to time, that is, they look the same whether they proceed forward or backward in time. 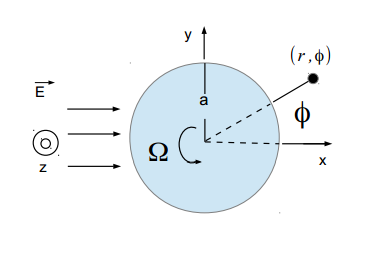 Others are symmetric if a particle is replaced by its antiparticle. When symmetry is broken spontaneously, new phenomena occur. Following the Big Bang, the universe cooled until its symmetry was spontaneously broken, leading to a predicted Higgs boson that is now being sought at the Large Hadron Collider in Geneva, Switzerland. With solids, liquids or gases, symmetry relates to the behavior of the spins of the atoms and electrons. In a ferromagnetic material, such as iron or nickel, the randomness of the electron spins at high temperatures makes the material symmetric in all directions. As the metal cools, however, the electron spins get locked in and force their neighbors to lock into the same direction, so that the magnet has a bulk magnetic field pointing in one direction. Nambu-Goldstone bosons are coherent collective behavior in a material. Sound waves or phonons, for example, are the collective vibration of atoms in a crystal. Waves of excitation of the electron spin in a crystal are called magnons. During the cooling process of a ferromagnet, two symmetries were spontaneously broken, leaving only one Nambu-Goldstone boson in the material. On the other hand, solid crystals, regardless of their compositions or structures, have three Nambu-Goldstone bosons, equivalent to the three vibrational modes (phonons). Yoichiro Nambu shared the 2008 Nobel Prize in Physics, in part, for explaining that in some systems, the number of broken symmetries equals the number of Nambu-Goldstone bosons. The new theorem expands on Nambu’s ideas to the more general case, Watanabe said, proving that in weird materials, the number of Nambu-Goldstone bosons is actually less than the number of broken symmetries. One characteristic of states with a low Nambu-Goldstone boson number is that very little energy is required to perturb the system. Fluids flow freely in superfluids, and atoms vibrate forever in Bose-Einstein condensates with just a slight nudge. As a student at the University of Tokyo, Watanabe had proposed a theorem to explain materials’ properties through Nambu-Goldstone bosons, but was unable to prove it until he came to UC Berkeley last year and talked with Murayama. Together, they came up with a proof in two weeks of what they call a unified theory of Nambu-Goldstone bosons. “Those two weeks were very exciting,” Watanabe said.